First off, let me thank Trent Telenko for turning me onto the Xanatos Gambit at at ChicagoBoyx, which started me on this particular chose of a gaggle of wild geese..
That’s brilliant — not a win-win play, but an i-win-anyway ploy. [Linguists — remind me whether ploy is a warped variant of play, will you?] And Trent then identifies the Xanatos Gambit as Donald Trump’s characteristic play.. ploy. A Xanatos Gambit is a plan for which all foreseeable outcomes benefit the creator — including ones that superficially appear to be failure. The creator predicts potential attempts to thwart the plan, and arranges the situation such that the creator will ultimately benefit even if their adversary “succeeds” in “stopping” them. 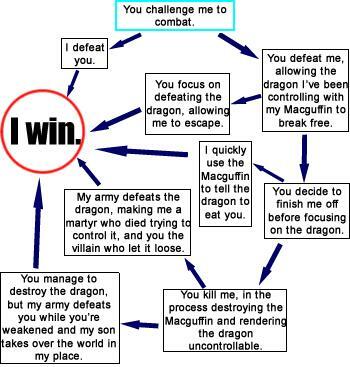 When faced with a Xanatos Gambit the options are either to accept that the creator will get the upper hand and choose the outcome that is least beneficial to them, or to defeat them by finding a course that they didn’t predict. A Xanatos Gambit is a Plan whose multiple foreseen outcomes all benefit its creator. It’s a win-win situation for whoever plots it. The key to strategy… is not to choose a path to victory, but to choose so that all paths lead to a victory. Xanatos Speed Chess trumps Xanatos Gambits. Plans can break down. You cannot plan the future. Only presumptuous fools plan. The wise man steers. What? That I used two fourteen-year-old pawns to turn a knight and topple a king? It’s chess, Daniel. Of course you don’t understand. Tend to be played by The Chessmaster, logically enough. Well, I could go on, but let me just list some of the pages I came across, and invite you to look where your interests take you.. If your first reaction to seeing the plan unfold is “There is no way that you planned that!”, then it’s roulette. by fate’s own eighteen wheeler..
from the steps below the throne. see all men as wind in a cage of bone. Another poem of mine — brought down from the attic. I cannot forecast to you the action of Russia. It is a riddle wrapped in a mystery inside an enigma, but perhaps there is a key. That key is Russian national interest. Nobody is more dangerous than he who imagines himself pure in heart, for his purity, by definition, is unassailable. Surely this is the answer to Decision Theory and Human Behavior — don’t we all do it this way? Listening to episodes of The History of England Podcast umpteen times as I code Java, TypeScript, *, &tc., I’ve heard host David Crowther (a “bloke in a shed”) make the point umpteen times that the primary job of a king of occupied Britain was to keep a firm hand on his barons. And what was the secret of successful kingly baronial management? Evenhanded distribution of political patronage. This Crowtherism appeals to me. A central pillar of my crackpottery is a personal rule of thumb I’ve flogged nearly umpteen times: politics is the division of power. You know you’re nigh unto umpteen when the POLITICS IS THE DIVISION OF POWER t-shirt goes on sale. We’re not there yet. Once more unto the umpteenth, dear friends, once more. Patronage is always a significant share of any activity involved in dividing power, which is to say a significant share of all activity involving mankind. Like politics, death, or taxes, patronage is an inescapable marker of mortality. An almost as ineradicable characteristic of mortal man is a belief that patronage in its many guises can be dispensed with altogether, usually by tilting the division of power in favor of the right sort of bloke. A bloke, of course, whose primary qualification is that he agrees with us. And will (sotto voce) give we who uphold his right sortedness a greater division of power than the wrong sorted. Anyone who claims they can create a society made up of mortal men free of patronage or of its common subspecies like cronyism, redistribution, logrolling, &tc. is either a fool, a knave, or, worse, both. You don’t choose not have patronage: in making such an attempt, you merely choose another diversion for patronage. Significant patronage is always diverted into the hands of barons. All flavors of power, however gradually, fall to those hands which most convincingly turn it into violent power. Baronial hands tend to be hands practiced (or regularly embraced by hands practiced) in the art of converting other forms of power into specifically violent power. Power is fungible: it can, with varying ease, be shifted from one form of power to another. “Purely” economic power, for example, is violent power in embryo. Inevitability will convert it into violent power, either sooner by incumbent baronial hands or, later, at the hands of barons who expropriate it from them. The hard-faced Bretons, Normans, and frogs imported into occupied Britain after its conquest by Guillaume le Bâtard AKA “Billy the Conq” were not the sort who found walkable cities, attend symposiums, order gourmet lattes, or hang out at artistic cooperatives. They had one business: violence and its fruits. Managing these stone-faced entrepreneurs of violence and their descendants demanded the most stone-faced killer of the lot. In a Billy the Conq, Guillaume le Roux, Henri I, Henri II, Richard I, Edouard I, Edouard III, or Henry V, you find men who kept their barons tightly leashed, partly through stone-faced Murder Death Kill, partly through evenhanded division of power through bestowal of patronage. In a Jean sans Terre (“Too late to be known as John the First, He’s sure to be known as John the Worst“, as we sang incessantly as children), Henri III, Edouard II, Richard II, or Henry VI, you have men who never got the mix right, aggressively vacillating between puddy-faced killer and fickle font of uneven patronage. In a Stephen or Henri IV, you find men who managed to get by, but only just. Some deserved sequels. Some make you wonder why they bothered making the original. Frustrated barons usually expressed their frustration by doing what they did best: being violent. There was actually a legal process of withdrawing fealty, a sort of right bestowed by custom to rebel against the boss if you thought the boss was a jerk. But, as in any exercise of agency, the right to make a choice is only loosely connected with the right to choose its consequences. The right to rebel is not necessarily the same as the right to rebel successfully. You could be a baron as frustrated by Henri II as you’d be by his son Jean. However, as Jean only experienced fleeting moments of relief from his chronic buffoonery, you’d have a greater chance of rebelling successfully against Jean than you would against stone-cold Henri. Many frustrated barons rebelled even against the most dread king. If they faced a strong baronial manager, they’d usually be crushed or, depending upon circumstances, bought off until they could be crushed. If they faced a weak baronial manager, there’s a chance they might not only grow their division of power, they might even get a turn at directing which troughs it’s poured into. It was very much a business decision, only with a distinct possibility of exit with extreme prejudice at the hands of the king if their enterprise failed. Patronage was, and remains, inescapable. But its flow can be managed and its effects mitigated. Though baronial violence is the historical default for resolving disaffection over patronage, it’s not the only way to manage patronage and specifically baronial patronage profitably. It’s certainly not the most productive.